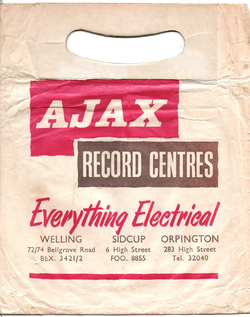 I used to Run the Orpinton Branch in the early 70's and Started my working life as a Record store assistant at the Welling one - From 1969. Amazed to see one of the early plastic bags. The Managers name of the overall record stores was Michael Jacobs. In those days he drove a BB4 Aston Martin! Comment-Jeff White.